Have you seen Wendy’s Twitter account?! With over 1.6 million followers, they’re not doing too shabby. Here’s why. Wendy’s throws shade on Twitter, they roast their competitors, and they know the lingo of their customer base. Maybe this isn’t anything like your brand personality, but there’s a lot you can learn from Wendy’s Twitter account. Wendy’s Twitter has gotten a ton of attention and gained notoriety for their distinct brand voice that includes constant zingers to users and competitors alike. Last year they picked a fight with Burger King (and won), and have gone viral several times since due to their quick wit. It may be more dangerous to pick on Wendy’s than an actual comedian at this point. Wendy’s voice and brand is unique to them, but small businesses can learn from their overall strategy and apply those lessons to their own social media accounts. Regardless of whether you roast people or not (if you do, please proceed with caution), there are four big things we can all take away from their epic social media game. We talk a lot about “brand personality” and “your voice” when it comes to both content marketing and social media marketing. Your business’s brand and voice can help set it apart from competition, making you unique and helping you build more concrete relationships with your customers—even if you never see them face to face (or only for a few seconds in a drive-thru line). And Wendy’s personality is definitely well defined and distinct. Their sarcasm and fearless humor is the central part of their brand, and it shows up in the majority of their tweets. Even if they’re not roasting someone, a lot of their posts are clever, casual, and funny. Their content is promotional, but it’s still so much fun. People actually check in to see what Wendy’s is doing and how they’re responding to other users because it’s so ridiculously entertaining. The phrase “don’t troll the troll” comes to mind; if you take Wendy’s on, you know they’ll come back with something fantastic. The lesson here: find the voice that fits with your brand and center your content around that personality. Make your business’s brand unique and distinctive, and you’ll pique users’ interest. Wendy’s accomplishes both of these checkpoints in droves. No computer could come up with the clever, highly entertaining posts that they share. Wendy’s Twitter also strikes the perfect balance of straight up promotional content and content that’s meant to entertain and drive engagement; in many cases, they skillfully blend the two in a way a lot of brands don’t. Wendy’s also shares a heavy dose of user generated content (UGC) by seeking out and retweeting great content; they’ll even share content they were never directly tagged in if its great and relevant. Since UGC is the most authentic form of marketing, this is a great strategy. Picking a strategy and sticking with it is (barring any true catastrophies) can be a great plan. Consistency is a huge benefit on social media, both in terms of what you’re posting and how often. Wendy’s posts frequently, and while they use a variety of different content types, everything on their feed makes sense when looked at as a whole. They maintain their spit-fire voice instead of relying on a few great one-liners every six months. This long-term consistency allows them to keep engagement high, and keep their momentum going. This is something many brands fail to do; they’ll have one great campaign, and they get a ton of attention, and then it all kind of tapers off. Several Old Spice campaigns, for example, have done this. Wendy’s, however, went in ready to maintain what they were working on—and it’s paid off. Our last major lesson that all small businesses can learn from Wendy’s is to always be extremely responsive. Thanks to the immediacy and constant accessibility of the internet, people want responses to any and all interactions, and they want them now. And Wendy’s is ready. Wendy’s responds to an immense number of user tweets, even the ones that are clearly just looking to egg Wendy’s on. Wendy’s responds quickly, and while they clearly address any and all tweets possible, they make sure to respond quickly (and seriously) to users who have complaints. They never let a complaint go unanswered, and they make it clear to the user that they want to resolve any issues. If it takes them a little while to answer, they’ll even apologize for the delay. Wendy’s actually replied and gave them a number: 18 million. 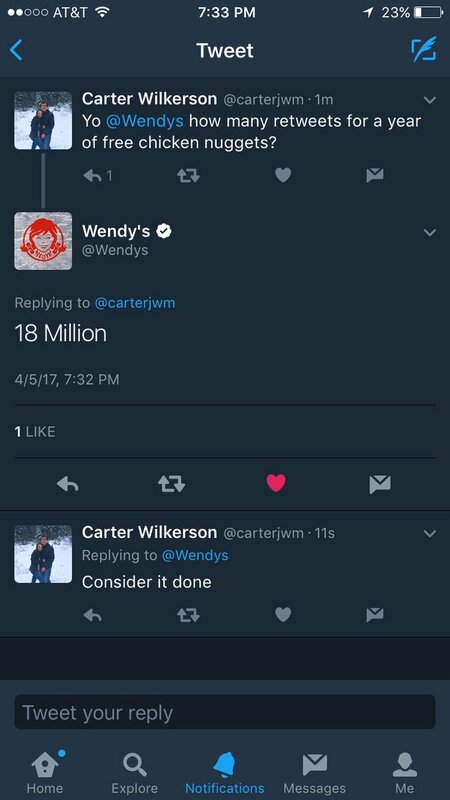 So far, the user (Carter Wilkerson) has gotten over 2.7 million retweets, and Wendy’s is getting so much publicity it would probably be worth giving this guy a year of free nuggets. Wendy’s has a multiple person team handling their social media, but tools like Agorapulse’s social monitoring and reviewing can make it possible for you to handle and address every single user interaction with your brand. You can spot mentions, and quickly flag down and resolve customer issues from our user-friendly dashboard. You can also flag or assign tweets and comments to team members who might have a stronger brand voice (or whose wit is on fire that day). While Wendy’s has a professional (and very witty) team supporting the brand, all small businesses can adapt the strategies they use. They’ve created and maintained a distinct voice that relies heavily on authenticity, and are now known for their exceptional responses, both customer service and otherwise. At the end of the day, this comes down to consistently giving your customers what they want and showing that you care. This will go a lot further than you think. Speical thanks to Ana Gotter and agorapulse for letting us reshare this awesome blog.